Huawei officially launched its 5G multi-mode chipset Balong 5000 — along with the first commercial 5G device powered by it, the Huawei 5G CPE Pro. The Chinese tech giant claims that together, these two new products provide the world’s fastest wireless connections for one’s smartphone, home, at the office and on-the-go. We don’t doubt that. Balong 5000 officially unlocks the 5G era, according to Huawei. This chipset supports a broad range of 5G products in addition to smartphones, including home broadband devices, vehicle-mounted devices and 5G modules. Photo courtesy of Huawei. 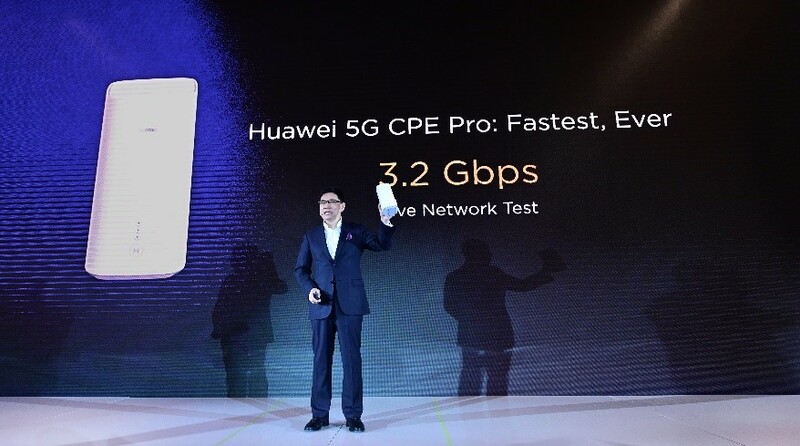 Huawei’s 5G CPE Pro achieves a high speed of 3.2 Gbps in live network tests. Balong 5000 supports 2G, 3G, 4G and 5G on a single chip. It reduces latency and power consumption when exchanging data between different modes, and will significantly enhance user experience in the early stages of commercial 5G deployment. “Balong 5000 is the first chipset to perform to industry benchmarks for peak 5G download speeds. At sub-6 GHz (low-frequency bands, the main spectrum used for 5G), Balong 5000 can achieve download speeds up to 4.6 Gbps. On mmWave spectrum (high-frequency bands used as extended spectrum for 5G), Balong 5000 can achieve download speeds up to 6.5 Gbps — 10 times faster than top 4G LTE speeds on the market today,” Huawei said. Adopting new Wi-Fi 6 (IEEE 802.11ax) technology, the Huawei 5G CPE Pro delivers speeds of up to 4.8 Gbps. It is the first 5G CPE that supports HUAWEI HiLink protocols, bringing smart homes into the 5G era. The NY Times reported that in 2018, Huawei edged out Apple as the second-biggest provider of cellphones around the world. Richard Yu, who heads the company’s consumer business, said in Beijing several days ago that “even without the U.S. market we will be No. 1 in the world,” by the end of this year or sometime in 2020. Last year, AT&T and Verizon stopped selling Huawei phones in their stores after Huawei began equipping the devices with its own sets of computer chips — rather than relying on American or European manufacturers. The National Security Agency quietly raised alarms that with Huawei supplying its own parts, the Chinese company would control every major element of its networks. The N.S.A. feared it would no longer be able to rely on American and European providers to warn of any evidence of malware, spying or other covert action. Qualcomm (US) is an important player in the 5G chipset market. It has strong expertise in 3G, 4G, and Wi-Fi, which has helped the company develop chipsets for 5G. Qualcomm has been a leader in the mobile processor market and is likely to dominate the 5G market as well in the future. Qualcomm has also collaborated with industry leaders to drive and implement 3GPP 5G New Radio (NR) standardizations along with field trials. In the past 2 years, Qualcomm has significantly demonstrated its strong inorganic growth strategy. In February 2018, Qualcomm announced that its Qualcomm Snapdragon X50 5G modem has been selected for use in live, over-the-air mobile 5G NR trials with multiple global wireless network operators in both the sub-6 GHz and millimeter wave (mmWave) spectrum bands. AT&T, British Telecom, China Telecom, China Mobile, China Unicom, Deutsche Telekom, KDDI, KT Corporation, LG Uplus, NTT DOCOMO, Orange, Singtel, SK Telecom, Sprint, Telstra, TIM, Verizon, and Vodafone Group will conduct the trials, which will be based on the 3GPP Release 15 5G NR standard. Intel (US) is among the key players involved in the development of 5G chipsets. The company offers 5G chipset modems and embedded chipset-based small cells to support the initial network trial. The company has dominated the market for microprocessors for several years and now intends to develop itself in the cellular chip market. The latest release of XMM 8000 series of modems, along with partnership with network operators and cellular device OEMs, is expected to improve its position in the 5G chipset market in the coming years. According to the MarketsandMarkets the 5G chipset market is expected to grow at a CAGR of 49.2% between 2020 and 2026, from USD 2.03 Billion in 2020 to USD 22.41 Billion by 2026. Growing demand for high-speed internet and broad network coverage with reduced latency and power consumption is supplementing the growth of the 5G chipset market. The Huawei article was not a survey of 5G chip companies. If it were I would’ve also written about Samsung’s 5G silicon for its base stations and different chip sets for its smartphones/tablets. Also Mediatek in Taiwan is making 5G chip sets and contributing to 3GPP release 16 which will be that organizations IMT 2020 RIT submission to ITU-R WP5D.